ISTANBUL, Turkey (CNN) -- Thousands of mourners were joined Monday by Turkish Prime Minister Recep Tayyip Erdogan at the funerals of victims killed in Sunday's double bombing in Istanbul. 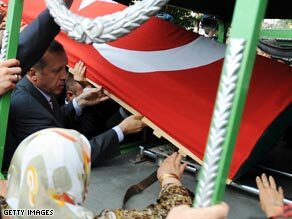 Prime Minister Recep Tayyip Erdogan helps put a coffin onto a funeral car. Seventeen people were killed and at least 154 injured, according to the Anadolu news agency, when the bombs went off close to each other and only minutes apart. Erdogan and other government figures have pointed the finger at the PKK -- a Kurdish group fighting for its own autonomous region in the southeast -- but the group has denied responsibility. "Terrorism is a phenomenon that does not have a religion, people, homeland or race," Erdogan said. Tensions between Turkey and Kurdish rebels have been rising as Istanbul stepped up its campaign against the PKK. Less than two weeks ago, 86 people -- mostly critics of the government -- were indicted on charges of being involved with an alleged terror group called Ergenekon, which aims to topple the Turkish government. Istanbul Gov. Muammer Guler called the blasts "an act of terror," and said the devices were placed 15 meters (49 feet) from each other. The first was a stun grenade that was detonated to draw attention before the second blast went off, he said. One bomb had been placed in a trash can. The blasts happened within 10 minutes of each other in Istanbul's crowded Gungoren community about 10 p.m. (3 p.m. ET), said Zafer Karakoc, who witnessed the explosions, told CNN Turk. Karakoc is a journalist with Turkish news agency DHA. Dozens of firefighters and paramedics were on the scene, and several bloodied people were driven off in ambulances afterward. Glass and debris were strewn all over the brick sidewalks, and shop windows were blown out. A few bodies were still covered in blankets as ambulances arrived. Journalists on the scene reported seeing body parts around the square, which is closed to vehicle traffic and a central place where tourists and residents gather in the evenings. More than 150 people were taken to hospitals, said Hayati Yazici, assistant to Erdogan. The first blast drew people to the scene before the second explosion, increasing the number of casualties, he said. Authorities asked residents to evacuate the heavily pedestrian, working class Gungoren neighborhood within an hour of the blast, reporters told CNN. "This is just the type of neighborhood that ordinary people live in," journalist Andrew Finkel told CNN, adding later: "They're shocked, they're angry. They can't believe they were targeted." Earlier this month, at least six people, including three police officers, were killed in a shootout near the U.S. consulate in Istanbul. Two other police officers were wounded.